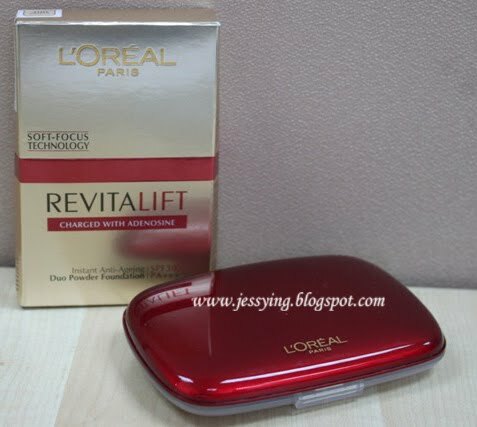 L’oreal Revitalif range was launched back in 2007. 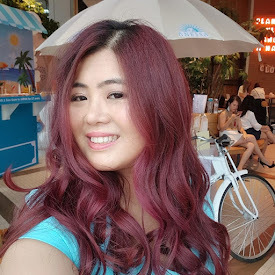 It consists of complete skincare range and today they launched L'oreal Paris Revitalif Duo Powder Foundation SPF30 PA+++ for anti-ageing protection in a makeup form. Comes with a plastic red packaging which give it a touch of luxurious and exclusivity feeling rather than the boring usual white, silver or black cover. It was stated that this Revitalift Duo Powder Foundation which is ultra gentle in texture but tough on ageing will give your skin total anti-ageing care with its potent formula that works not only to combat ageing signs but to also give your complexion instant youth. It claimed that fine lines will be smoothed, wrinkles will be reduced and features will be illuminated, giving you a fresh and vibrant complexion. Ultra-gentle powder foundation: Charged with Adenosine, it smoothen fine lines and wrinkles with an instant lifting effect. With light, short strokes, apply in downward direction to even out under eyes and blend out unevenness. Defining highlighter: Ivory cream highlighter provides a luminous and lifted complexion for up to 8 hours. With corner of sponge, lightly pad the ivory cream highlighter on outer cheekbones, nosebridge and above eyebrow arches. 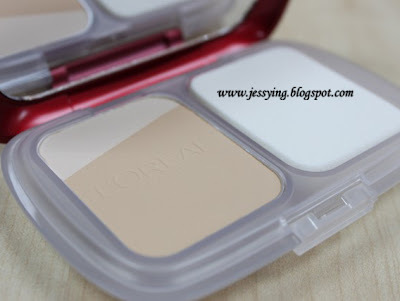 My Review : I found that the powder foundation texture was surprisingly very fine and smooth. Pores looked less visible and laughing line look less obviously and most importantly it does not look cakey on my skin! Apart from that, this foundation give quite a good coverage as it is able to even up skin tone and lightening the pigmentation. 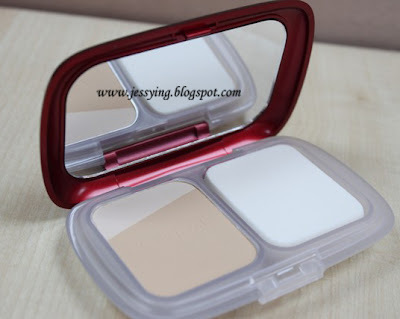 And I like the highlighter which was included in this compact as it is much more convenient to use and I use it sparingly as I do not want to look too fair on the highlighted areas. And the SPH30++ formula came as a bonus to me (when I forgot to put on my sunblock) as I would still apply sunblock whether or not I am putting on makeup. I would think this is a good buy from drugstore/pharmacy considering it is quite a good foundation considering the price. L'oreal Paris Revitalift Duo Powder Foundation SPF30 PA+++ (7.5g) which comes in 10 shades is available at all L’Oréal Paris counters nationwide. Priced at RM69.90. bisa dipakai dr usia brp ya sis?